There is a way we can be rich toward God. We can expend the energy of our life in such a way that it brings us a balanced life. In today’s economy, we can try to keep up with the Joneses and think that is where life is found. All the while, we do not realize that we are forfeiting life along the way and chasing an elusive rabbit. Once we get where we think we want to be, we find life is not there. We have given it up; we have traded it away. We have forfeited it because we did not recognize what life is all about and what being rich toward God is all about. There is only so much energy during the day and it changes during our lifetime. I have certain pockets of energy. My greatest asset is not time because we all have the same amount of time. The question is: how are we going to utilize that time with the energy we have? How do we do that? We all want to be able to look back after 10 years and see the benefits of how we used our time. We want to see fruitfulness. We want to see something of abundance. Jesus came that we might have life and that we might have it more abundantly. If we have energy, we can do the things we are supposed to do. We can take the time. It is not spending time, but it is taking that time in order to convert it into deeper relationships. For example, we can take the time and convert it into a relationship with our children. It is taking a certain amount of time and converting it into something that will be beneficial. So our greatest asset is not time; it is energy. Energy converts time into a higher stratum that is something greater or of benefit. Time in itself is raw. We mix it with the right amount of energy that is appropriate and time is converted into something greater. “So teach us to number our days that we may present to You a heart of wisdom” (Ps. 90:12). When we number our days and invest them wisely, wisdom will be given to us. If we squander our energy or use it poorly, then we are known as someone who is not very wise. We need to know the difference or discern the difference between that which is eternal and that which is temporal. We are going to have to invest energy in both. There are some things that will only exist in this earthly life. There are other things that are going to be forever. “Do not store up for yourselves treasures on earth, where moth and rust destroy, and where thieves break in and steal. But store up for yourselves treasures in heaven, where neither moth nor rust destroys, and where thieves do not break in or steal; for where your treasure is, there your heart will be also” (Matt. 6:19-21). He is telling us to make sure we are storing up for ourselves treasures in heaven, not just on earth. If we have an unbalanced investment of energy in just one of these, our soul will be empty. We must invest in both. Have any of us craved something so much that we would do anything to get it? We would even compromise and shuck and jive a little bit. Then, later, when we get it, we realize … this is not what I really wanted. A leanness in our soul starts to develop. That is why we must invest our energy wisely. We must know what is eternal and what is temporal. “Woe to those who add house-to-house and join field-to-field, until there is no more room, so that you have to live alone in the midst of the land!” (Is. 5:8). There is an emptiness that comes to our soul when we compress our lives so much. We just cannot get any more in it. That is not in a negative or weird way, but prosperity in the way that God designed it. That is where you begin to find what life is truly made of. “‘For I know the plans that I have for you,’ declares the Lord, ‘plans for welfare and not for calamity to give you a future and a hope” (Jer. 29:11). What gives us that sense of security for our future and a hope? It is a Hebrew word that, when translated, means welfare or prosperity. It is the word shalom. So what does shalom mean? It means “peace,” but not just a peace that is defined as an absence of war. The word shalom has more than one definition — true friends, security, completeness, quiet strength, close friendships and freedom from fear. That is what peace is all about. Is that not what we all want? Sometimes, that is what we think money is going to buy, but money cannot buy the type of peace we desire. Only Jesus can give that to each of us. That is the word shalom. What are God’s plans for us? To give us a shalom — a sense of well-being; a sense of peace. God says that we must regain balance by prioritizing what is eternal: God, family and self. When we know the difference between eternal and temporal, we start to develop a balanced life. Then God can deposit into us because we are poised for posterity. 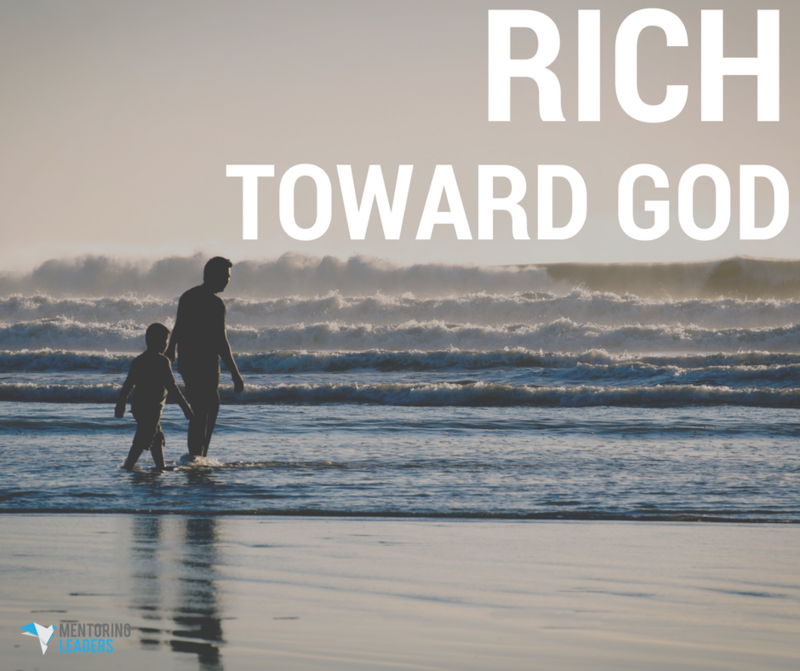 Then we will understand what it means to be rich toward God … this is the kind of life we want to live.